After years of underdeveloped railway infrastructure, Southeast Asia is about to enter a period of expansion and revitalization. New lines are set to connect neighboring countries for the first time, and high-speed trains between major cities will provide an alternative to air travel. Here are some of the notable projects that are either underway or have been approved for construction. The Kunming–Singapore Railway has been proposed via three routes; Myanmar, Laos, and Vietnam-Cambodia. There is no railway in Laos (apart from a 3.5km extension from the Thai border) so this route will be a new line over 400km long. The route will travel from the China-Laos border, via Luang Prabang, Vang Vieng, Vientiane, and onwards to Thailand. The railway will pass through mountainous terrain, requiring over half of the length to be through tunnels and on bridges. Construction is due to begin in December, 2016. With three potential routes of the Kunming-Singapore railway converging on Thailand, Bangkok is set to become the railway hub of mainland Southeast Asia. Long distance trains in Thailand currently depart from Hua Lamphong station. This 100-year-old station will eventually close when the new Bang Sue Central Station opens. Bang Sue will have 24 platforms, making it the largest station in Southeast Asia. It will accommodate commuter services, two airport links, and international rail services. Construction is expected to be completed by 2019. There have been several high-speed railway proposals in the region, including Jakarta-Bandung, Bangkok-Chiang Mai, and Hanoi-Ho Chi Minh City. The one that is most likely to begin construction first is the Singapore-Kuala Lumpur line. These cities are an ideal pair for a high speed rail service. They are 350km apart, and a 300km/h train will complete the trip in 90 minutes, making it a viable alternative to flying. Despite both countries having railways close to the border, there has never been a train that has connected Bangkok to Phnom Penh. Cambodia is rehabilitating the line from Phnom Penh to Battambang, and plan to extend the line to Poipet on the border. Thailand is currently building a 6.5km extension from Aranyaprathet to the Cambodia border. Once this is complete it will be possible to travel between the two cities by train. The Thailand extension is expected to be completed by 2016. The Phnom Penh to Poipet rehabilitation is ongoing. A railway on the second largest island in the Philippines has been on the drawing board for years. With the current president being the first Mindanaoan to hold the office, a railway on Mindanao has now become a top priority. There is a plan for a 2000km network to cover the island, and the government has stated it wants to award building contracts by the end of 2017. 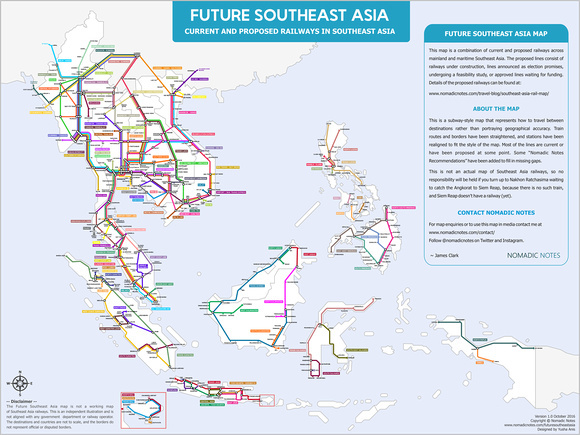 For a complete list and a map of proposed railways in Southeast Asia visit Future Southeast Asia – A map of proposed railways in Southeast Asia.